Recitals and shows by schools from elementary to college, with themed days and workshops. In the week that includes the feast day of our Patron Saints “Quirico and Giuletta” there are events every evening: The Junior Talent Show, the Senior Talent Show, themed evenings, plays in dialect, procession through the town and Mass, light-hearted team games and, on the final Sunday, dinner in the Piazza with entertainment. 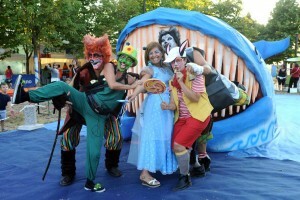 In the last week of July, from Wednesday to Sunday, the historical centre of Serra San Quirico is transformed into Never-Never Land. Once you have received your ID card at the Customs Post and put on your cardboard ears you pass through the mouth of a whale and are swallowed up in a succession of shows, games, painting, puppet theatres, slides and old wooden games. If you are hungry there’s popcorn, “biscotti di mosto” with Nutella and candy floss in abundance. And if you prefer, there’s an open-air restaurant for dinner, and the fun continues with evening performances in the theatre area. On Saturday, under the loggia there are workshops for children. These start with the crushing of the grapes, then the pressing and subsequent boiling to produce the mosto. Then on a long table the children can make the biscotti using mosto and all the other ingredients with the help of the grandmothers of the village. There are also stalls selling craft products, shows and games, which finish off after dinner with a fire-eater. There are stands selling gastronomic specialities such as filled ‘cresce’, typical local dishes and, of course, the unmissable ‘biscotti di mosto’ with Nutella. The piazza fills with children dressed as Santa’s little helpers. In the centre there is a large fir tree where the children can hang decorations and balls made beforehand at home, and as night falls the lights are switched on. In the piazza there’s also Santa’s grotto where the children can take their letters for Santa together with one of their old toys destined for others less fortunate than themselves, telling Santa their wishes for Christmas. Under the loggia are stalls with craft products and stands serving snacks. The festival finishes with the launching of miniature hot air balloons and lanterns in the piazza. Three afternoons between 26th December and 6th January. 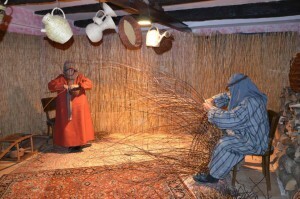 Live figures in scenes representing daily life in the cantinas of houses in the historical centre and under the Copertelle. The Annunciation, the ancient crafts, the Inn where Mary and Joseph couldn’t find room, the donkeys, King Herod and the Nativity all along a route through the suggestive alleyways of the historical centre of Serra San Quirico by night.